For this blog, we have decided to post one of the group member’s written field trip reports for each field trip taken. Our first field trip/field trip report assignment was to go to a farmer’s market in San Francisco…. 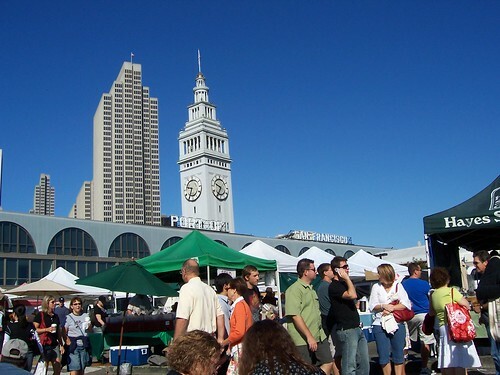 “Today (9/9) I went to the farmer’s market next the Ferry Building in San Francisco’s Embarcadero. I arrived during the last hour of the market and came across Chue’s Farm Fresh Vegetables, a vegetable stand from Fresno, CA (just under 200 miles from San Francisco. As the vegetable stands at this particular farmer’s market were scare, I decided to stop and talk to the farmer at Chue’s. I learned which vegetables are meant to be grown in the fall and winter growing seasons in both San Francisco and Fresno. I learned that eggplants are suitable to be planted in the fall and winter growing seasons in both parts of California; however, a particular species of eggplant (the Chinese eggplant) can only be planted in Fresno area. I also learned that herbs such as mint are very suitable for the fall and winter growing seasons. For more information regarding farmer’s markets in the San Francisco Bay Area please go to http://www.sfgate.com/food/farmersmarkets/.